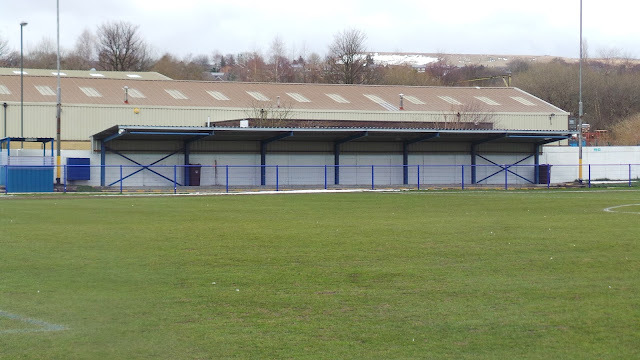 The club was founded in 1886 but between the years of 1899 and 1992, they were known simply as 'Glossop'. Mossley was one of the earliest members of the Football League, even spending a season in the top tier when they finished bottom of the 1st Division. This was thanks to funding by Samuel Hill-Wood who would go on to become chairman of Arsenal. They'd finish 5th in the 2nd Division following relegation and would stay in the Football League until the outbreak of the First World War. Once the hostilities were all over, they dropped down to the Lancashire Combination. Next up was a spell in the Manchester League before joining the Cheshire League in 1978. 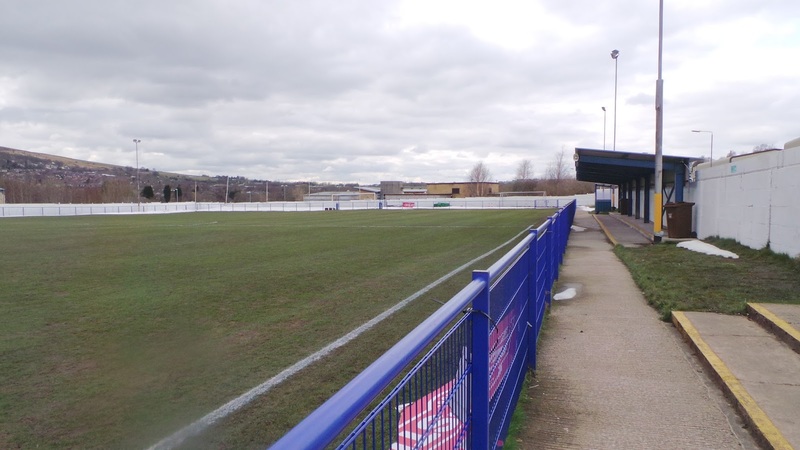 Four years later the league was absorbed into the newly-formed North West Counties League. 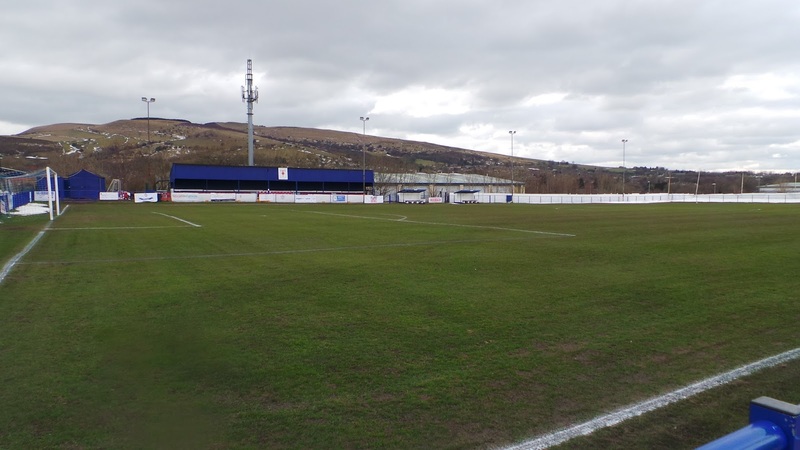 Glossop would remain in the top tier until 1988 when after two consecutive bottom-placed finishes, they were relegated to the 2nd Division. 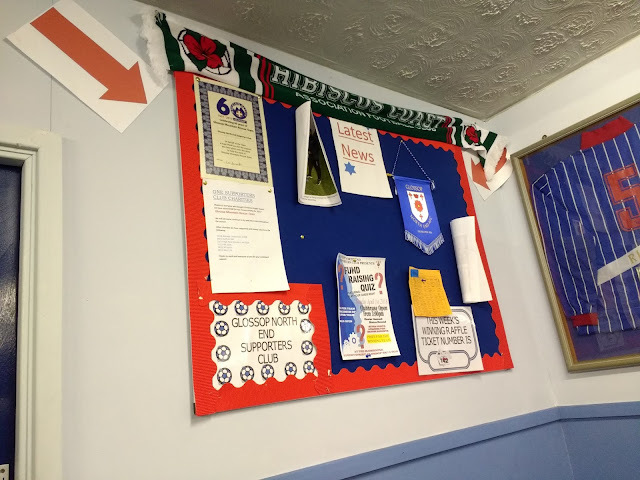 They'd remain there for 20 years, finally being promoted following a 7th place finish in 2008. This gave Glossop North End a new lease of life and by 2015, they were North West Counties League champions, earning promotion to the NPL's Division 1 North in the process. They've had some credible finishes since, finishing 4th in their debut season before a playoff semi-final defeat to Northwich Victoria. In the FA Cup, Glossop got to the Quarter Final in 1909, losing in a replay to Bristol City. Sice they've been a non-league club their exploits have been less impressive, with the 3rd Qualifying Round in 1983 being their best progress so far. 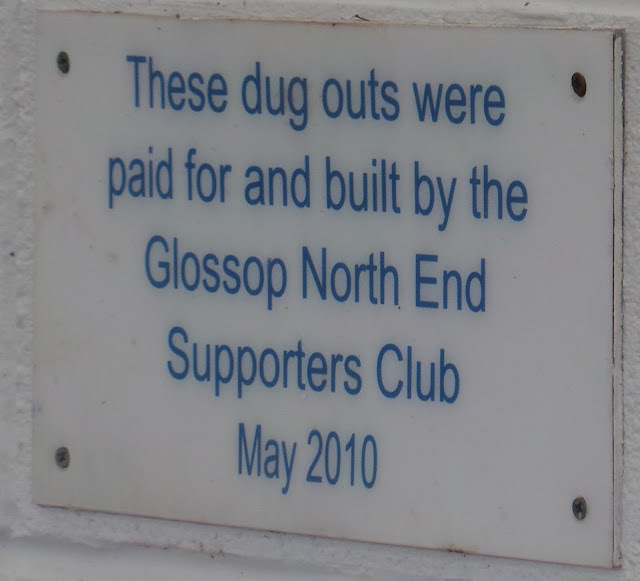 Glossop have not pulled up any trees in the FA Trophy so far although they have two FA Vase Finals to their name - losing to Whitley Bay in 2009 and North Shields in 2015.Local Cup wins include the Manchester League Gilcryst Cup four times, the Manchester Premier Cup twice, the Derbyshire Senior Cup in 2001 the North West Counties League Cup in 2015 as well as their Division 2 Cup in 1991. The club's record attendance of 10,736 came against Preston North End in a 1914 FA Cup tie, although this was at their old North Road Ground where they played up until 1955. Cricket is still played on the ground as it was a home venue for Derbyshire for a short time in the early 1900s. The town of Glossop itself is one of the smallest in the UK, indeed, being the smallest to host a top-flight football team. The town's history is based in cotton making and weaving but nowadays it gets most of its business from tourism, with it being on the edge of the Peak District. I was never sure where the first game of my week off was going to be. When I booked a week off towards the tail end of March almost nine months previously, I’d not envisaged the wintry scenes that would occur. For the second time this month, we’d been beset by flurries of snow and as a result, choosing somewhere to go had been a bit of a lottery. I’d chosen the safe option of the 3G pitch at Bromley for my Saturday game, but that was a revisit. I’d spent most of my time at home in the warm, celebrating my time off by generally eating and drinking too much and relaxing. But I’m the sort of person who likes to get out and about and was keen to do a game as soon as possible. So a Twitter list was set up with Monday’s options - Dronfield Town and East Yorkshire Carnegie the favourites due to their easterly location but I was also considering Nelson, Daisy Hill and Whitchurch Alport. The Monday morning came and any hope of a lie in was put paid to when I woke not much later than my usual work time. 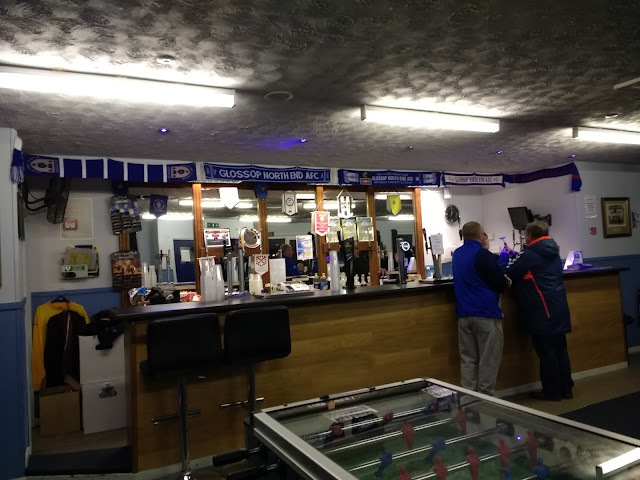 I checked my chances of a game that night, but as you would imagine with volunteer-run clubs whose helpers all have full-time jobs and families to take care of, news was thin on the ground. The only definite news was that Dronfield were having a pitch inspection at 3.30, though I feared that traffic would make things too tight and that all I’d have to look forward to was a double helping of Coronation Street that evening. I walked down town and back, arriving home at midday. 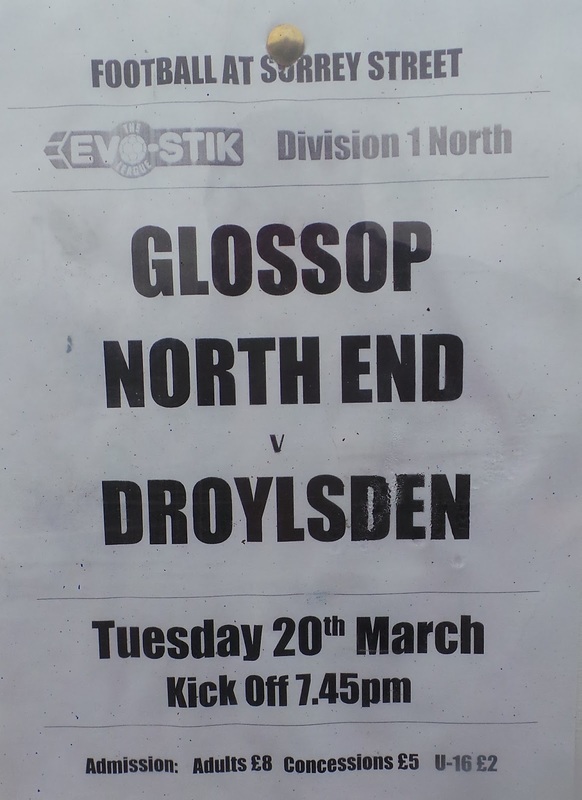 Though the three clubs in the North West had declared their games on, I decided against going as I'd left it too late to book a hotel. I did at least pencil in plans for the next couple of days, booking a hotel in Glossop with the intention of visiting Glossop North End tomorrow. 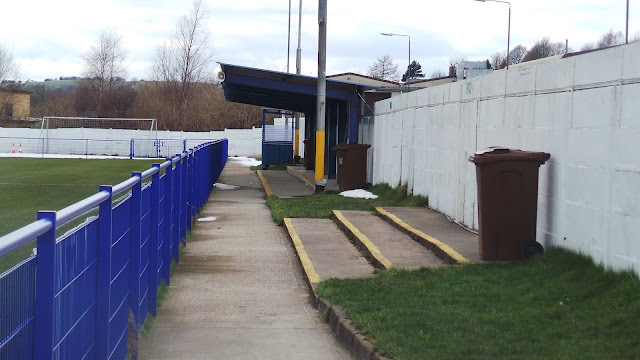 I also planned in a double on Wednesday - a revisit to Mossley in the afternoon and a new ground at Worsborough Bridge in the evening. The rest of the afternoon was spent putting in the research for the next couple of days before a decent evening of TV. 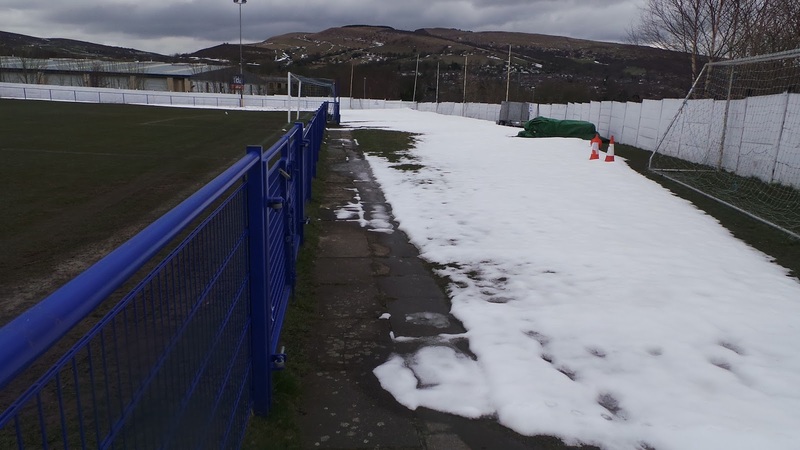 I'd been planning to do a revisit to Mansfield Town in the afternoon, but yet again the weather had intervened and the tie was switched to Wigan Athletic's training ground, a fact that I was lucky to spot to save a wasted journey. 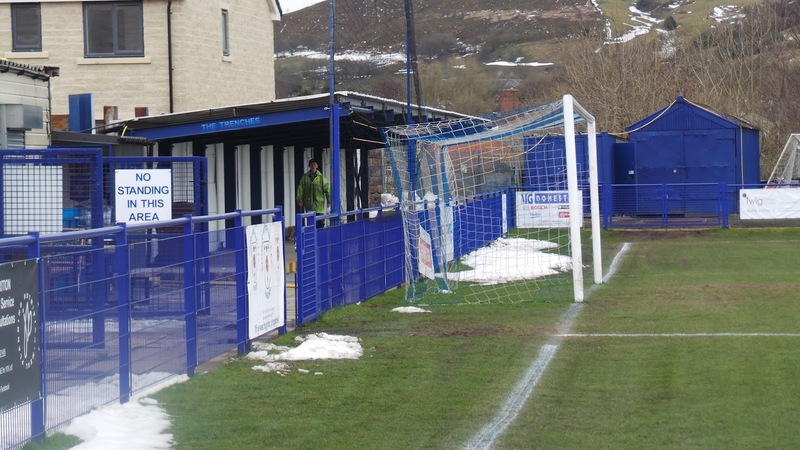 Glossop was looking doubtful for my Tuesday night game, so I set up a Twitter list with all my potential options. On the day of the game, I woke up just after 6 am, much earlier than I'd wanted to. I listened to Mike Graham on TalkRADIO whilst I'd waited for the time to come for me to leave. In terms of game options, one of my options, Chadderton, had already bitten the dust and Glossop were planning a pitch inspection at some point during the day. 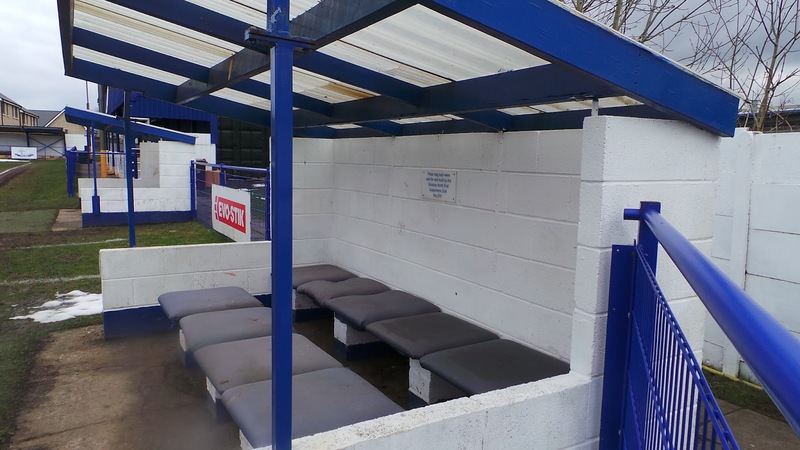 In terms of game options, West Didsbury and Chorlton was my favoured backup, with Bamber Bridge and Thackley close behind. I eventually left at 9.45, stopping for fuel at ASDA along the way. 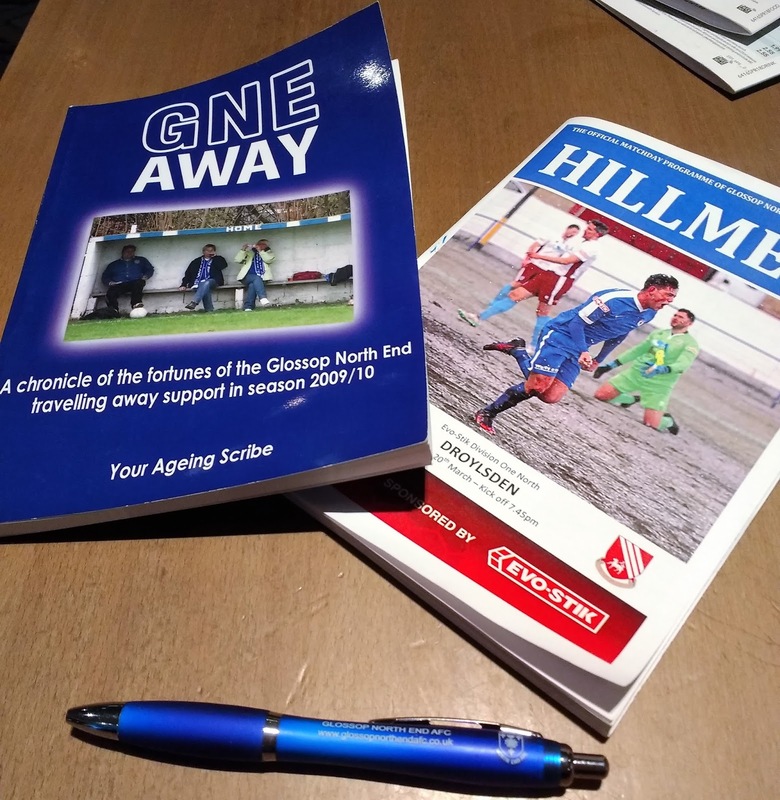 Another stop for a rest was had at Hilton Park and at this point, there had been no news on my game tonight. 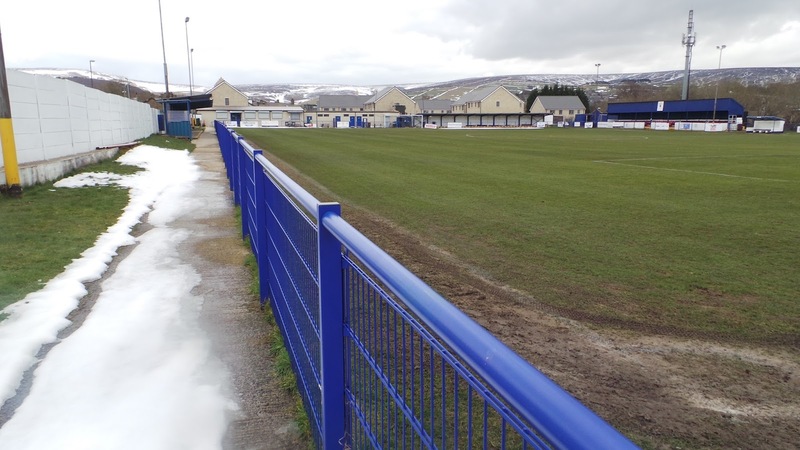 I got to Glossop just before 2PM, deciding to look in at the ground on the way to check if the game was likely to go ahead. 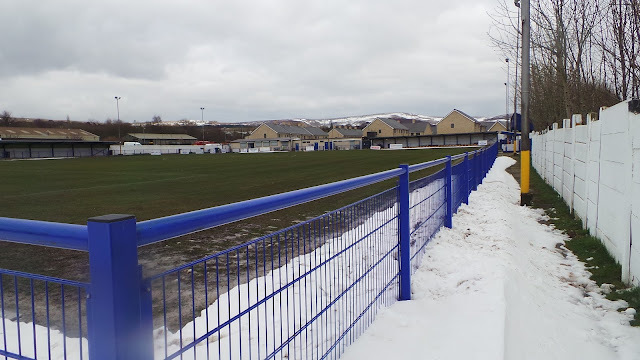 The friendly groundsman had done an excellent job and it was clear from the amount of snow along the side of the pitch, that a lot of work had been put in. 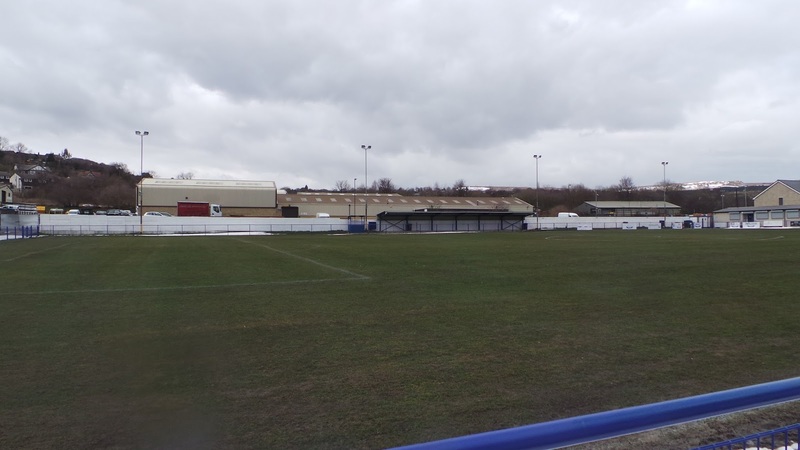 I got some pictures of the ground during daylight before going and checking in at my B&B, just down the road from the town. 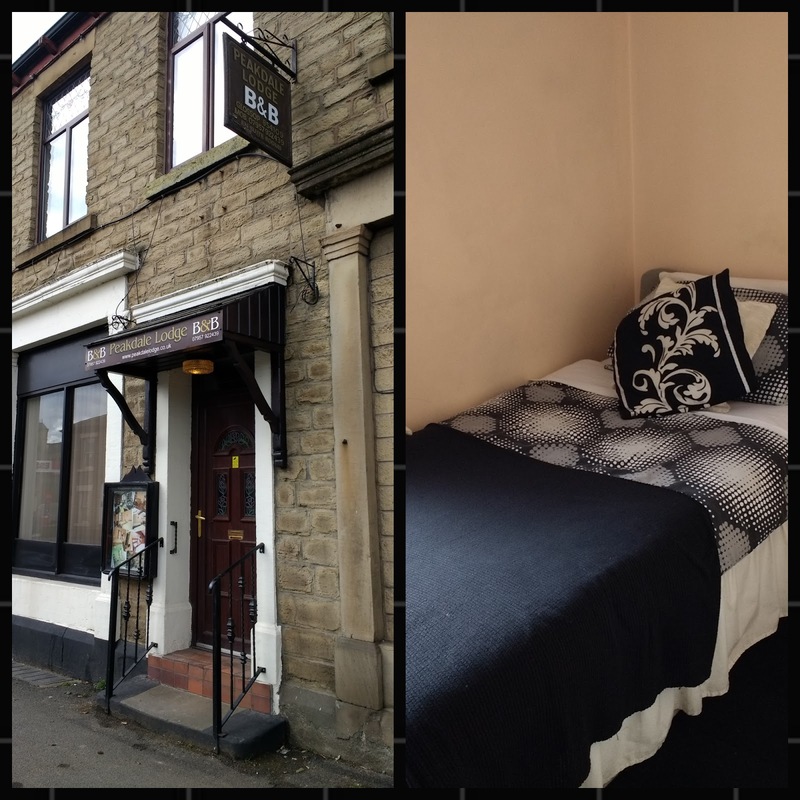 The Peakdale Lodge was decent value at £30 a night including breakfast and although it wasn't high luxury, it was clean and cosy. I'm always skeptical of whether a referee might postpone a game for some reason, so I didn't want to go out drinking straight away. Instead, I stayed in my room, catching up online and typing my blog for a couple of hours before going into town at 4.30. 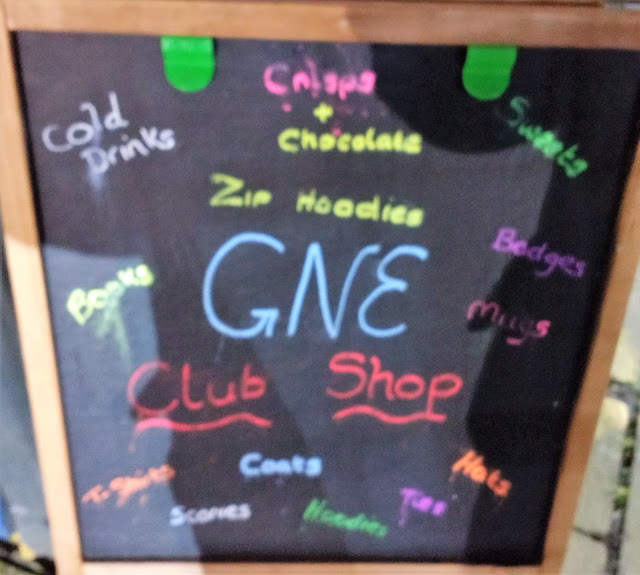 I had a look around the shops, buying a few random snacks. By the time 5.15 came, I went to Wetherspoons for my dinner. There I had a mixed grill and a pint of Wobbler before going back to my room. 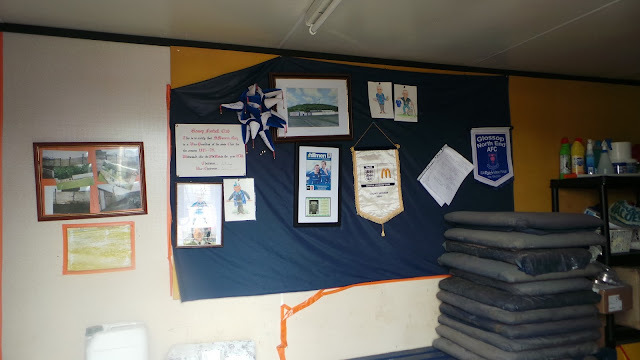 I dropped some stuff off and had a drink of Irn Bru before resting for a while. By now, I was getting a little more relaxed that the game would go ahead. I'd been recommended a pub near the ground, The Friendship, so that was my first port of call. It was OK, I guess, pleasant enough. I had a pint of Strongbow for £3.60, but this was £1.50 more expensive and a whole lot less enjoyable than my pint in Wetherspoons earlier. I'd rather have had a pint at the ground and given the money to the club in all honesty. 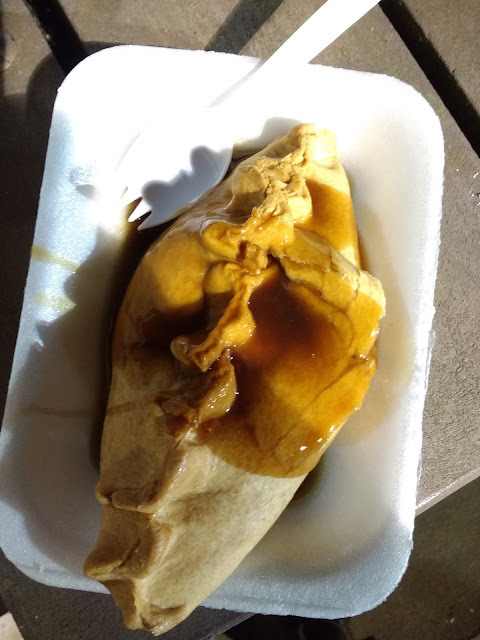 At least it got my hunger for the Glossop pies going, these had a great reputation amongst many people and I was looking forward to trying one. After paying £8 entry and £1.50 for a programme, I went to the bar, paying £3.20 for a pint of Dark Fruits. 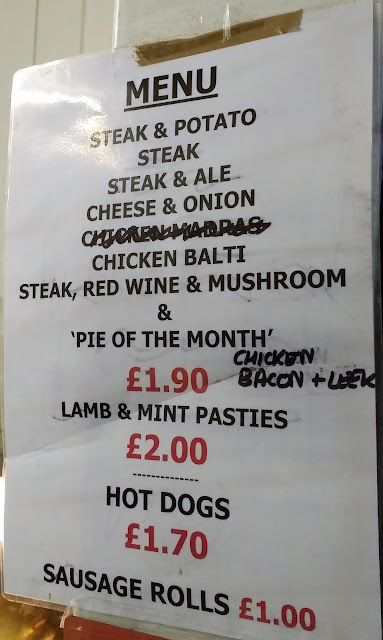 I also sampled a couple of their pies, around £2 each with gravy and in my opinion, the lamb and mint pastie beat the balti pie although they were both nice. 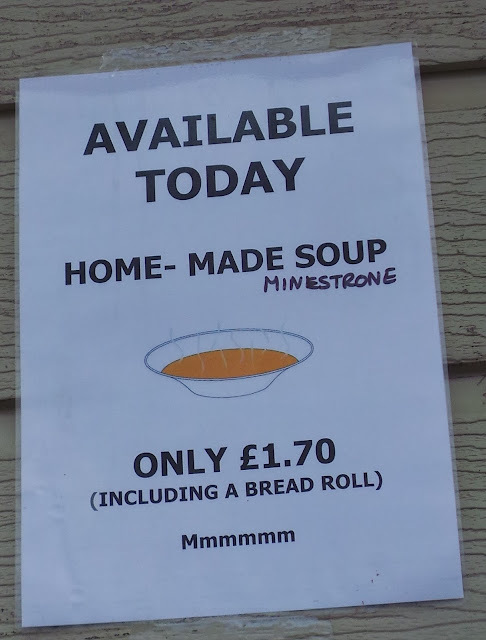 I was going to try a sausage roll too, but they had sold out. 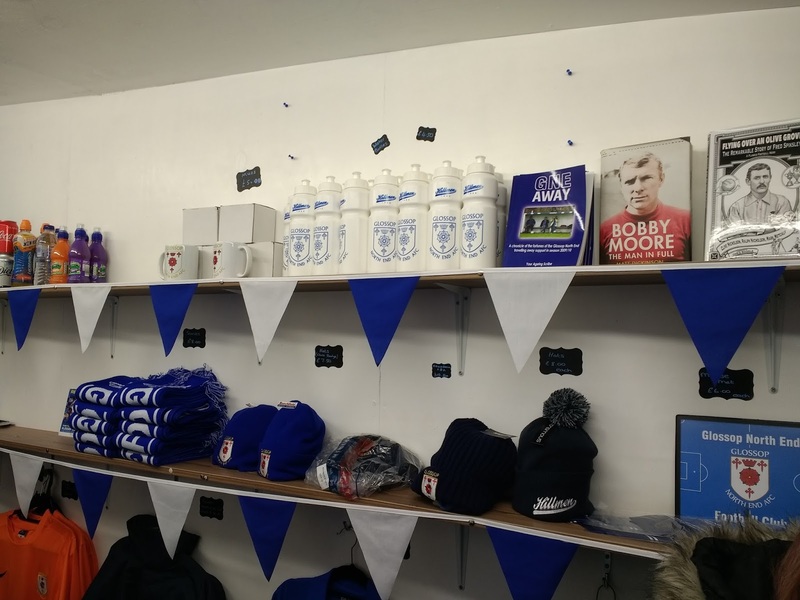 Before the game started, I went to the club shop, buying a pen and book for £3. The opening period had plenty of action and commendable effort, but little composure or quality in front of goal. Glossop opened the scoring on 26 minutes when Darrhyl Mason attempted to cross the ball from the left and although his effort was blocked, he followed it up with a shot past visiting keeper Ritchie Branagan from around six yards. 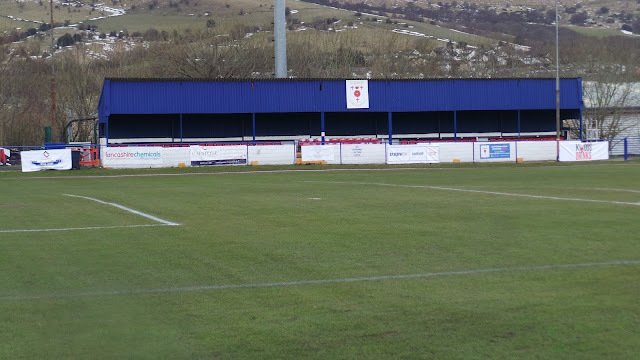 It was all square on 35 minutes, the ball was crossed from the right, a header was cleared off of the line and Dominic Smith followed up from close range. It was the least Droylsden deserved, as they had enjoyed the better of the first half. 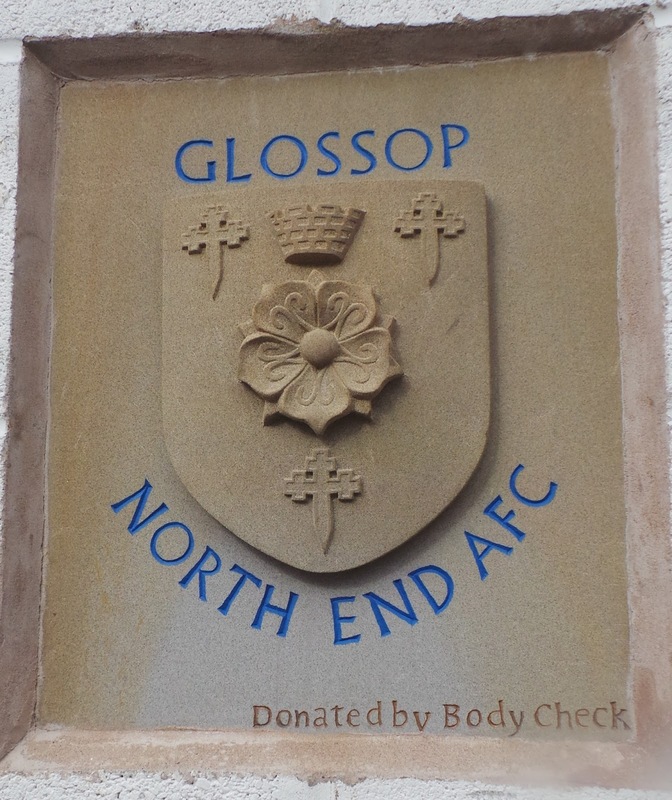 The second half belonged to Glossop with them having the majority of possession but lacking the finishing touch and a bit of luck. 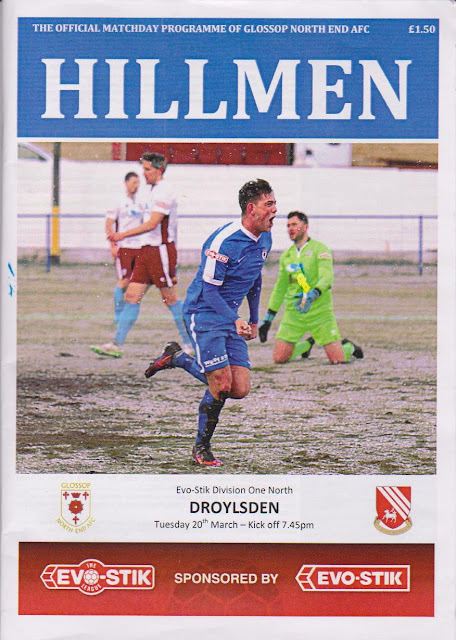 Droylsden almost snatched it at the end too but their man couldn't connect with a corner that fell to him at the far post. 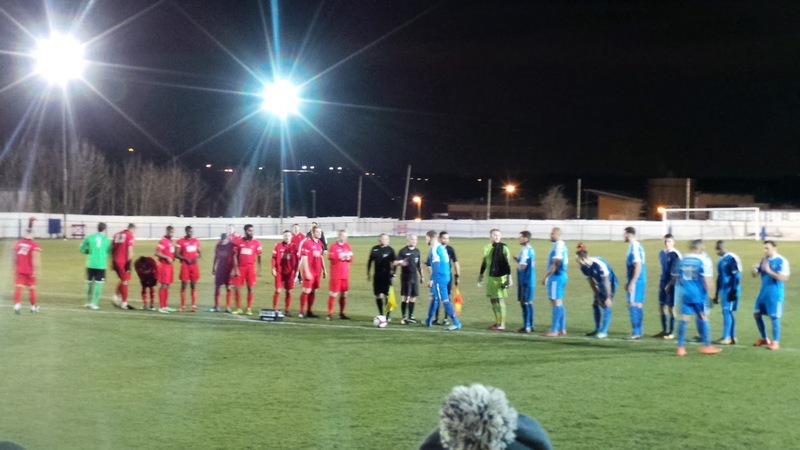 It had been a decent contest for the 188 watching spectators and an enjoyable evening at a friendly club. I headed back into town or more specifically Wetherspoons for a couple of pints with me getting back to my room around 11 where I promptly dropped off to sleep. SURREY STREET is a lovely ground set in the rolling hills of the Peak District. 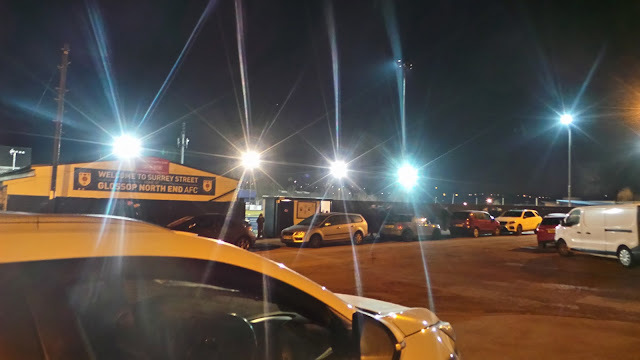 As such, there are lovely views to be had during the day, but even at night, there's plenty to shout about. 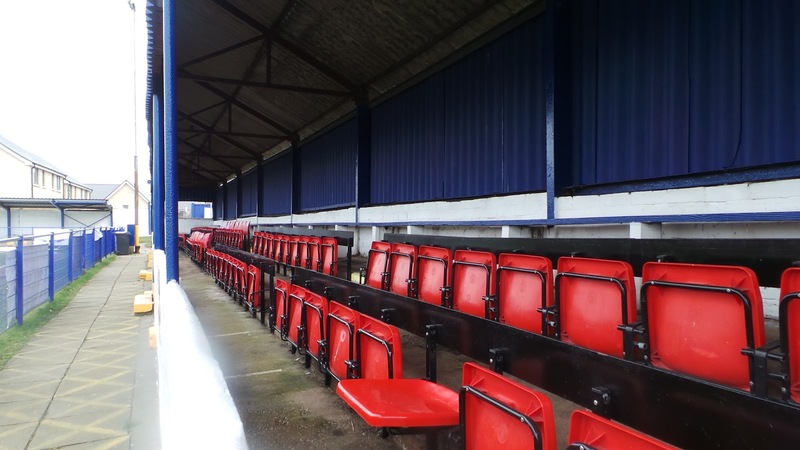 Three sides have partial cover and this includes around 200 seats. There is also plenty of open terracing. Parking is OK but mainly limited to street parking. 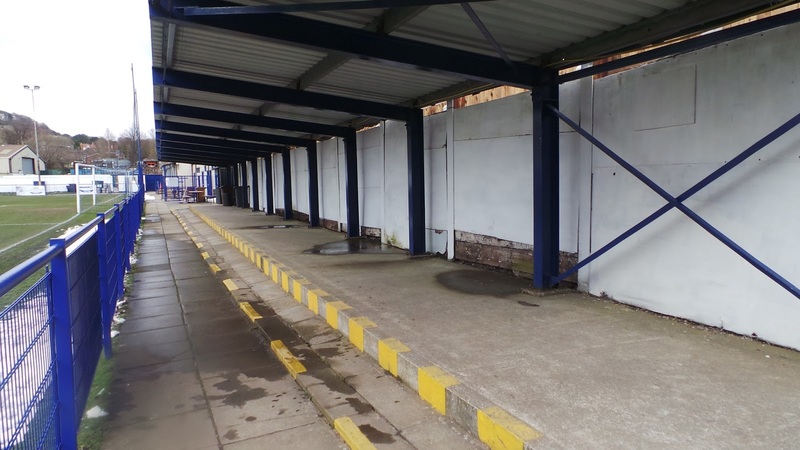 It's located close to the pretty town centre where a range of pubs and eateries can be found. 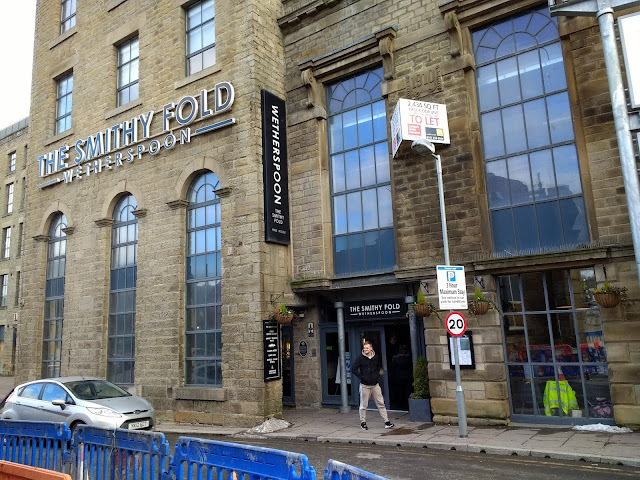 For drinking, your best bet is probably the Wetherspoons, The Smithy Fold as it is cheap and does a good range to suit all tastes. Food-wise, you can also eat here although you would be much better off sampling the excellent pies at the ground.